Boballoonie's antics have delighted children from 1 to 101 for more than 25 years. This jolly joker enjoys silly magic, comedy, balloon creations & general tom-foolery. And he is a very nice balloon artist ... according to his mother. Rusty's antics have delighted children from 1 to 101 for more than 25 years. 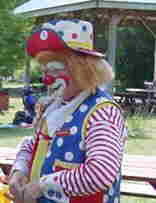 This jolly joker enjoys silly magic, comedy, balloon creations & general tom-foolery. And he is a very nice clown ... according to his mother. Site Animation: Boballoonie's antics have delighted children from 1 to 101 for more than 25 years. This jolly joker enjoys silly magic, comedy, balloon creations & general tom-foolery. And he is a very nice magician ... according to his mother.